Rich moisture mist protects skin from harmful external environments. Vitamin C,E and mineral ingredients form aloe soothes sun heated skin gently. Multi type no only for face, arms and leg use. 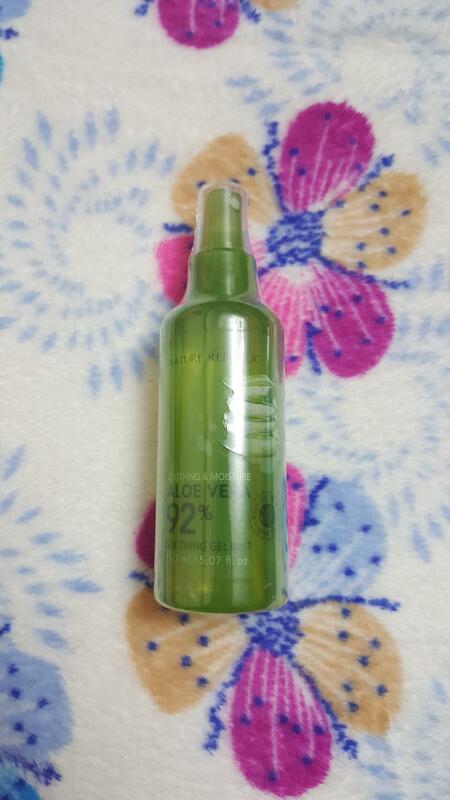 Radiant your Skin Care with the [Nature Republic] Aloe Vera Soothing Gel Mist 150ml! we aim to provide you best korean products to take good care of your skin, including Cosmetics, Skincare, Face Mist. Hydra Face Mist online. - Rich moisture mist protects skin from harmful external environments. - Vitamin C, E and mineral ingredients form aloe soothes sun heated skin gently. - Multi type no only for face, arms and leg use. The manufactured date of this product is on May 30, 2018. But the expiry date of each item could vary. We do still offer DOKU as one of payment method in Indonesia. Please check your IP first before you check out your order. What about the expiry date? mac…@gmail.com I super love this mist as its really refreshing and hydrating on skin. Its natural and smells good. During the day my skin get really dull as i have an oily skin. Just spray this mist and you can feel your skin hydrated. I really like the fact that the effect is instant. once you spray it you feel refresh instantly. Highly recommended to everyone!! maj…@gmail.com Very nice mist, makes my skin glow. abe…@gmail.com this spray is so awesome during summer especially when you going outdoor, must bring item! vic…@gmail.com It smells really good. The spray is an extremely fine mist, and the mist is really hydrating.